Years ago I got called to participate in a political survey. I had a bit of time and I said I would participate. The interviewer kept giving me either/or options to answer a set of questions, either A or B. I kept refusing. The questions were leading, the options were not equal. The survey was designed to get me to agree to a political stand I didn’t like by presenting no real alternative. I kept questioning the presumptions of the answers I had to choose between… and my interviewer was getting frustrated. Just answer the question sir, A or B. “But B presumes things that are ridiculous and I don’t like A and can see why you want me to say it.” Sir, I’m just asking the questions, and those are the only two options; you can say only A or B. They were forced-choices questions, like those we might use in any experiment to test ethics or morality or values. Do you let a train hit three kids playing on a train track or do you hit the switch moving the train onto a track that is known to no longer be used but there is one kid playing on it? Choose. No in between. No second scenario—you get either A or B. You have to instantly decide: is it better to let three die who shouldn’t have been there and are dying only because you didn’t choose to kill someone else in their place…or is it better to actively cause the death of only one child in the act of saving three? I don’t really like such questions. They might form interesting debates. But the world is rarely a place of forced choices. There are so many more options available; I find the world to be a sea of ambiguity, with very little that is objectively right or wrong. Unless of course I make myself the sole arbiter of right and wrong…. It’s convenient when I make myself god in such a way. But I am not god. On that I wish to be quite clear. But for a moment I’m going to give you a slight variation of a forced-choice exercise. When Jesus is asked by the Pharisees to confront the woman caught in adultery (John 8), which response of Jesus comes to mind first? I know, it’s not a fair question, but play along. Which comes to mind first? I ask because I think it’s important on two levels. First, I think it’s interesting to test our own “go to move” of whether we want first to hear about Jesus’ grace or Jesus’ judgement. What do you gravitate to? I will tell you that I struggle with the latter and love the former—and that is about to be very clear. I also think that what is so important about this text in John is that it reminds us that this text can NEVER (authentically at least) be a forced-choice exercise. Because Jesus does both. For Jesus this test was really about how he was being tested by the Pharisees and how they want to force him to either break the law or break her heart. And Jesus turned it on them… which of you is free from sin… whoever that is, let that one enact the punishment she is due. They do not. Because they know…they aren’t really any better than she is—they have simply hidden it better or done so in more socially acceptable ways. So they disperse. But then the rub. Jesus says, “and I do not condemn you either.” Now Jesus surely fits the bill of one able to do so. Surely he is, as we say, without sin. But he won’t do it. He will not condemn her. But he still tells her, go and sin no more. What? Is that law without accountability? Surely she will never feel the need to obey now that he has absolved her of consequence??? And yet…he didn’t absolve her to behave however she wants. He wants and desires that she sin no more…but he isn’t going to condemn her for her failures. And this is my rub with the world right now. We condemn everywhere. We have turned the world into a series of forced-choice exercises. An either/or world in which you are either right or wrong—you have either chosen the exact course I am on, or you are wrong. There is no room in this view for moral ambiguity and shades of grey, and I will confess this: I am not made for such a world. I see far too many shades. And I’m far too tired of blaming the world for being willing to engage in moral ambiguity. There is a time and place for everything under the sun, and I’m grateful to be in a world in which we form a chorus of different voices rather than all singing the same tune. This came to light for me in a very real-world way when I blogged last April in support of Planned Parenthood (you can find that here). I saw these workers who were willing to engage moral ambiguity for the sake of serving a population of people who felt they had no choices in life. They do not tell these people: either you are are right…or you are wrong. They present options and walk the journey to where that one chooses to go. And this is a journey I appreciate (even, and particularly, if I don’t always agree with the choices the other makes that I would not have made). I’m willing to acknowledge that this means PP leans heavily on the “I do not condemn you either approach” over the “go and sin no more” approach. But I think that is of value. I think that is what it means to when we say “God with us.” God is with us, not separated from us because of our sin. God chose us over purity. And so I said and so I have supported the work of PP to choose people over moral high ground. And I had many many people condemn me for it. Since that time I have learned a lot about the consequences of supporting Planned Parenthood. I sat with a wonderful clergy member who works for them, and he shared the ways he has been targeted by campaigns filled with condemnation, not just of his support but of his very person. I felt, in just a small way, some of that same attack. And I heard again about a month ago of other pastors who have been targeted, quite literally, for attack by groups that stand strongly opposed to the work of Planned Parenthood. I respect the moral conviction of these people. I really do. But I cannot condone their condemnation and stone throwing. I won’t name anyone in particular because…well then I’m doing the same thing, aren’t I? And I’d rather move us forward by building people up than tearing others down. And I cannot condone the tasks of condemning others because it isn’t productive. When we go on the attack, we do not give the conversation a chance. No one can be changed by it. And maybe that is the point: we don’t want to change either, so it’s easier to choose a tactic that will result in no change than to admit you might not be all right. I do not believe I am all right. I do think I’m a little right. And I do wish to have a productive conversation about how we are called to discern what is good and proceed in that way. And in order to do that we have to take the condemnation out of the conversation. I don’t just feel that way about my experience with Planned Parenthood. I feel that way about the conversation we need to have about law enforcement in our country. I want to acknowledge the huge debt of gratitude I feel towards those who take on the hard (impossible) task of serving in law enforcement. Who willfully walk into moral ambiguity every day and have to be willing every day to be killed…and to kill. And doing so every moment of every day means that they start out from the beginning knowing that sooner or later they will screw up…and it will have heavy consequences. But they do it anyway. And because of them I sleep safer at night. This doesn’t mean that there aren’t abuses of power. This doesn’t mean that there aren’t power-hungry and power-abusive law enforcement officers. This doesn’t mean there aren’t racial injustices sewn into the systems of law enforcement. I think all those things are true—just as they are also all true in my chosen profession. The church has poor racial history. The church has poorly addressed abuses of power and station. The church has to name and confront those realities. We need to be able to hold these two truths at the same time – they aren’t a forced choice either/or. I can affirm and call to account a person at SAME time. My problem? We treat this, and many other issues, as a forced-choice, either/or question. You are either in favor of all law enforcement officers as good, or against all as corrupt racists. We leave little in between in our rhetoric. Our conversation is dripping with condemnation. I could go on and on. I see the same in the ways we name white privilege and patriarchy. We represent an organization like Planned Parenthood as a monolithic institution whose only work is their most challenging work. They are far more than that – but to acknowledge that reality is to dismantle our own forced choice exercise. We choose confrontational language that backs ourselves into corners. Our prophetic words are fraught with unproductive condemnation…and we set up our world to guarantee that no transformational change can happen here. The impact Jesus had on that woman caught in an adulterous life? I don’t know. The story doesn’t go there. But a whole world of possibilities was opened up for the way he could change her life the moment he said, “And I do not condemn you either.” Now go…and sin no more. Maybe nothing changed. Maybe she rejected his mercy and advocated for hedonism…maybe she opened a shelter for women seeking to find a life free from oppression. Maybe she became a deacon in the church. I don’t know…but that is part of the joy. Because anything is possible. But had he condemned her? The world would have been small and narrow indeed. I do not know what is good, and what is right. But Micah tells me it is to do justice, to love kindness, and to walk humbly with my God. The trick here is to know that the words we often translate “love kindness” are more accurately translated “love (pursue with passion) covenantal-faithfulness (life bound together as co-workers (of justice)).” And this perhaps reminds us of exactly what Jesus did…to do our justice in way that builds up the one we are calling on to act justly—to remember that we are staying together bound by love of one another, and we are not to do our justice in a way that breaks that down. And to remember that through it all we are walking humbly with God…which means we recognize our own fallibility to such an extent that we cannot be sure we are right all the time. God is God, and we are not. Walk together—not condemning, but co-operating toward a more just and loving world. Teaching and learning from each other, dialoguing and working out with fear and trembling and loving-kindness our shared life together. There is no forced choice here. There is a field of possibility where the only given is togetherness. It is you and me, working our way to tomorrow in sickness and in health, as long as we both shall live. and was the first in a three part series on Singing the Faith. I do not preach from my manuscript so the two will track each other but not be identical. 12As God’s chosen ones, holy and beloved, clothe yourselves with compassion, kindness, humility, meekness, and patience. 13Bear with one another and, if anyone has a complaint against another, forgive each other; just as the Lord has forgiven you, so you also must forgive.14Above all, clothe yourselves with love, which binds everything together in perfect harmony. 15And let the peace of Christ rule in your hearts, to which indeed you were called in the one body. And be thankful. 16Let the word of Christ dwell in you richly; teach and admonish one another in all wisdom; and with gratitude in your hearts sing psalms, hymns, and spiritual songs to God. 17And whatever you do, in word or deed, do everything in the name of the Lord Jesus, giving thanks to God the Father through him. 1Make a joyful noise to the Lord, all the earth. 2Worship the Lord with gladness; come into his presence with singing. 3Know that the Lord is God. It is he that made us, and we are his; we are his people, and the sheep of his pasture. 4Enter his gates with thanksgiving, and his courts with praise. Give thanks to him, bless his name. 5For the Lord is good; his steadfast love endures forever, and his faithfulness to all generations. 1By the rivers of Babylon— there we sat down and there we wept when we remembered Zion. 2On the willows there we hung up our harps. 3For there our captors asked us for songs, and our tormentors asked for mirth, saying, “Sing us one of the songs of Zion!” 4How could we sing the Lord’s song in a foreign land? 5If I forget you, O Jerusalem, let my right hand wither! 6Let my tongue cling to the roof of my mouth, if I do not remember you, if I do not set Jerusalem above my highest joy. 7Remember, O Lord, against the Edomites the day of Jerusalem’s fall, how they said, “Tear it down! Tear it down! Down to its foundations!” 8O daughter Babylon, you devastator! Happy shall they be who pay you back what you have done to us! 9Happy shall they be who take your little ones and dash them against the rock! I grew up in a musical family, mostly a musical family. I grew up as the grandson of a church organist and everyone on my mom’s side was very musically inclined – not as much on my dad’s side of the family. In fact my dad has described passionate worship to me as a time when everyone is singing loud enough that he is sure no-one will hear him… at which point he will actually sing. But my dad attended lots of musical concerts over the years regardless of his enjoyment of the music in and of itself because his children were making the music. Music is not just an aspect of my childhood – music is all around us. My dad, for instance, can identify most birds simply by the music they make. There is music in him – it’s just a different tune and melody. Music speaks to all of us on some level because music is a part of the soul. We feel music. We hear music not simply as the words – in fact if you are a parent today (any day actually) and you ask your child how they could possibly listen to those words (to the song they like and you don’t) the child will likely say, “Oh I just like the beat.” I would argue that. I would argue that those words are going somewhere, we do not hear and encode all those words without them making an impact and forming us on some level but I do understand what is being articulated in that moment. Before we know the words – the beat and the rhythm, the melody and the harmony of the music speaks to us, connects with us, and moves us – even white middle class protestants can be slightly moved…. by music. And researchers will tell you that music is a great memory device – so will advertisers, by the way, we all have little commercial ditties memorized in our heads. But psychological researchers study how music works with the mind and its strong aid in memorization. Even more than just those catchy melodies it’s the rhythm and the rhyme, the patterns and alliteration, and the repetition of it all that driven by the melody. And I don’t want to get caught up too deeply in this track but some of those researchers argue that music predates our development our language. We were dancing and singing before we were speaking and writing. And this continues to be the case so we use music to teach, to memorize, to store information, and even retrieve it. Alzheimer’s patients have been known to hum familiar tunes to help fight off the loss of their memories[i]. Music connects us to an emotional experience and speaks deeply to us and becomes a part of us. We will all wake up with a song in our heads we haven’t sung or heard in forever… where is it coming from? Within you – it is a part of you. Music is in our soul. In this sense then we can see how music operates on some level as a memory devise, it is part of our soul and the spirit. It is for this reason that if you were to read in the Presbyterian Directory of Worship, by the way not always a very stimulating read, but informative – if you were to read there about the role of music it speaks to music as prayer. Music functions in our worship as prayer. We sing praise, we sing supplications, we sing out needs and wants and hope and promise. Our music then becomes not only a private and individual-encoding-of-my-being moment but it is a corporate prayer – a speaking of God, who in full mystery could never be spoken. God cannot be spoken but can be sung. Music speaks to our soul and music encodes our being; music speaks God, and music forms our relationship with God. And these are fundamental parts of music in our life, but ultimately the part I most enjoy about music is that music gives us voice. One of my friends told a story once about her young son pulling out all the pots and pans from under the kitchen cabinets and hitting them together and banging them and making a big racket. And when she – annoyed as we all would be – stopped him and asked him what he was doing he looking up at her – with what I imagine was a bit of twinkle in his eye – and said, “I’m making a joyful noise to God.” Music gives us a voice and we come with thanksgiving and gratitude and praise, and even those who have not felt invited into active worship can become participants by way of the music. That moment we open a hymnal – maybe we don’t even sing, maybe we just track it. Or maybe we can’t even that we just listen – and we listen ourselves into the worship. I have a very good and wise friend who speaks of a time in her life that was very difficult and in that time she could not bring herself to worship. She could not utter the words and feel the spirit of it all… but… she would sit in the back and let the congregation worship for her. Even as we listen we are part of the music of creation we worship with the simple hum of our breath and the beat of our heart. Psalm 137 has always been one of the most challenging pieces of scripture for me. How does one say, “This is the Word of the Lord,” after a psalm that ends speaking of the happiness of destroying the life of a child? But the importance of that sentence lies in the voice it is giving the people. It gives more voice to the people than to God… in fact isn’t that what we most love about God? That God gives us voice. And this voice is about the whole song – and that whole song is beautiful in the way it voices grief and hurt… and yes, anger. It is no wonder that the singer of that song, the pain that is given voice here, is moved to anger. Righteous anger that needs to be voiced and released. It is so easy to indict the last verse when you haven’t felt the pain of the singer. These also have held the still hearts of their own shattered children. They have known life ripped out of place. And they give voice to the anguish. “Our tormentors ask us to sing songs of our homeland. They think our grief is a traveling minstrel show – a performance for their entertainment. But we do not perform our grief for them. This is music is mine. My voice – an emotion experience that we release from deep within. Appropriating my voice for your entertainment is just one more level of hurt. In the 1920s African-American activists began to shun the singing of their spirituals citing that they were a movement of docility and servitude before their white masters. A young Howard Thurman, who would go on to become a great spiritual mentor to a generation and advocate for nonviolent protest, sought instead to reclaim the radical nature of these songs and the strength and hope they gave voice to – not docility but prophetic advocacy filled with protest. He writes in 1939, “’The slave was a man without a home… his primary social grouping had been destroyed, so it was not possible for him to perpetuate his own tongue… slavery stripped the African to the literal substance of himself, depriving him of the props on which men commonly depend – language, custom, and social solidarity.’ The spiritual became an attempt to find meaning in circumstance of radical discontinuity when old truths lost their power to explain, comfort, or succor.”[ii] Music gave them voice in a world that had taken it away. Just ask Mary, the mother of Jesus, about reclaiming voice and identity. Mary sings one of the great songs of our faith, the Magnificat[iii], a powerful word of protest against the political, social, and economic structures around us, as well as a great proclamation of the Gospel. Those who had no voice in the world were being given voice, word – made flesh – for them, among them, by God. We sing songs, spirituals, hymns – we speak the Holy, we let that which is a part of us free… even if it is only for a moment. In prayer and praise, in lament and hope, we sing the Gospel. We claim our voice and proclaim God’s grace. [ii] Quotes from Visions of a Better World: Howard Thurman’s Pilgrimage to India and the Origins of African American Nonviolence by Dixie and Einstadt. One of the great highlights of my vacation this year was going off-roading with my family and a friend from high school in Canyonlands National Park outside of Moab, Utah. 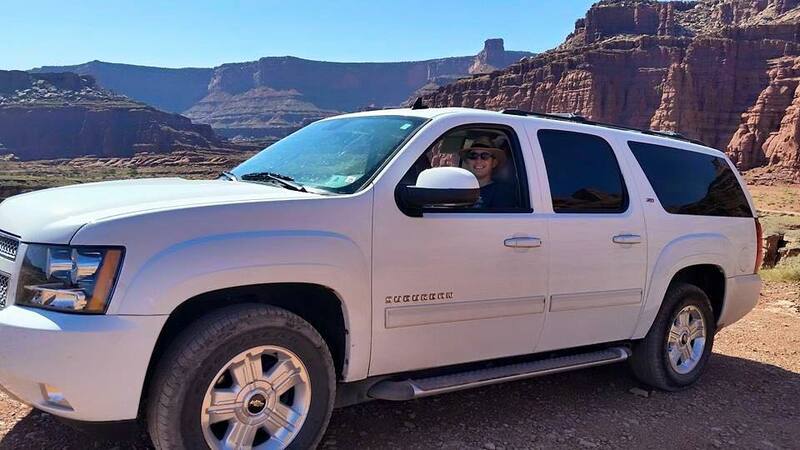 Me driving our car on the Shafer Trail in Canyonlands National Park, Moab, Utah. 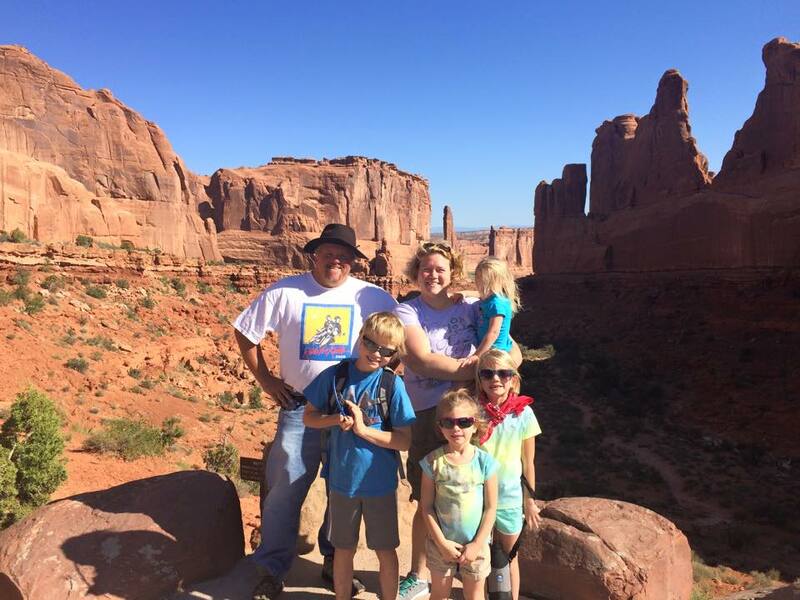 My wife, who is afraid of heights (exacerbated by four kids), is always willing to try to overcome such things in the name of adventure – but this one was a well agonized over adventure because we didn’t just go off-roading. We went down a canyon trail that included sheer drops, massive switchbacks, and the possibility of coming bumper to bumper with another vehicle trying to go through you. 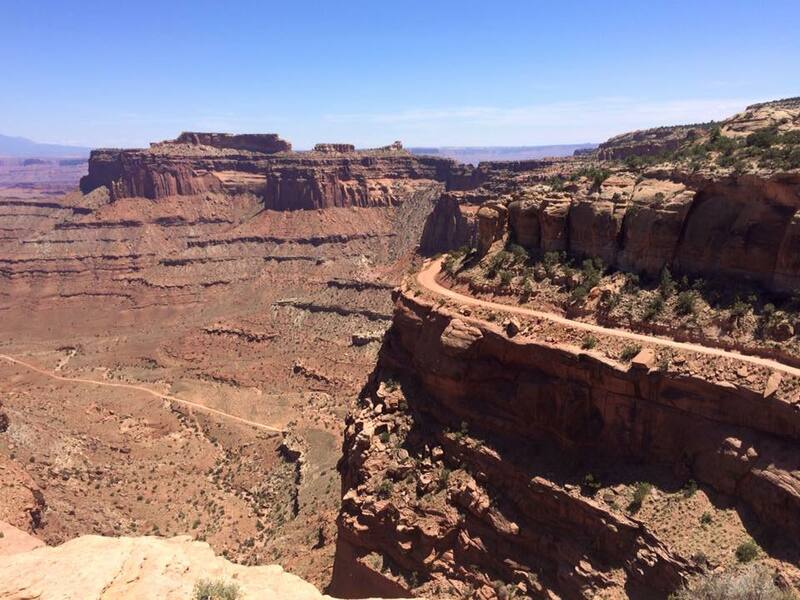 The top portion of the Shafer Trail. 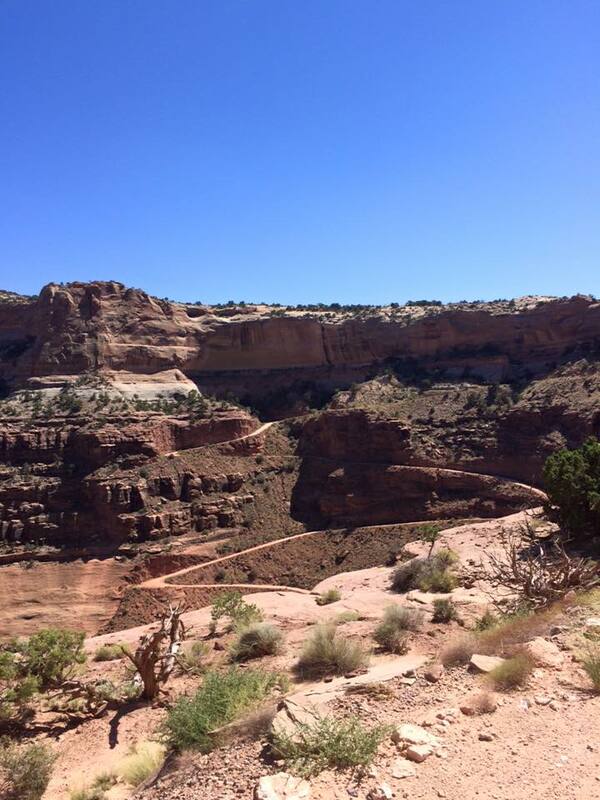 Switchbacks, if you aren’t familiar with them, are what get you down/up the steep sides of the canyons. After we got down the cliff we then ended up on a trail that was sometimes rock, sometimes sand, sometimes dried out water trail twisting along the top of the Colorado River as it wound its way through some very forbidding –but also gorgeous—landscape. 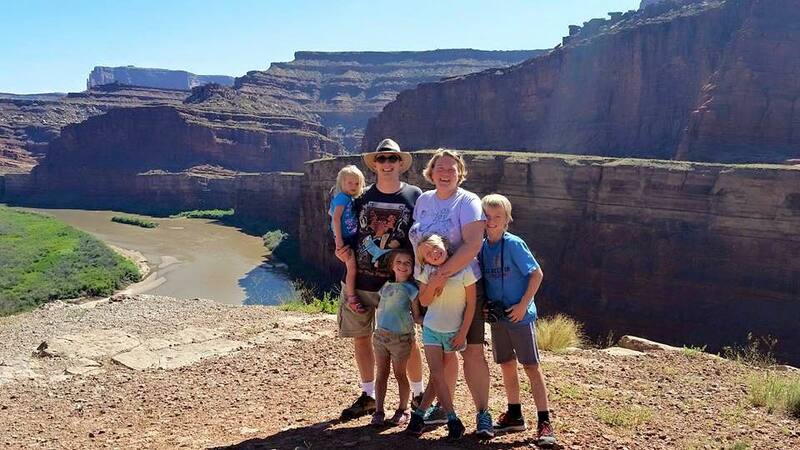 The Kukla family about half way through drive along the Colorado River. Tom informed me that the problem with off-roaders is that they watch commercials that show jeeps and rally cars flying around fast as can be “crashing through the land.” This, he said, teaches people that this is how they are meant to off-road and it’s affirmed in doing it because its great fun. But its hell on the car. Literally. If you actually have to drive the car and maintain it in good working order you would never off-road like that. You don’t, “crash through” the wilderness because that kills your tires and axles and overall physicality of your vehicle. You don’t attack the land, you ride with it. You move along it. You travel it gently and carefully and… invitationally. I think Tom has learned to teach from the land. Traveling the land has taught him to travel with people in just the same way. Not crashing through, and then throwing away all that we wrecked along the way. But learning to live with, alongside, and even directed by the world toward path of less resistance that lives with – and not just upon- the earth. I was brought into this process and it was like one of those tuning fork moments. Enlightenment moments. My being felt centered in this wisdom. We are meant to travel along the world, alongside people, with gentle care. Instead we hurry, we crash around, we force a way through, and we conform the world to our wishes –rather than conform our lives to the landscapes around us. Just think about how often this is true in so many different places. How many places are we like rental jeeps crashing into and at “war” with the world around us (and even wthin us). And then you wonder why our “knees” creak and our bodies wear down and we why we have to hide from the consequences of the way we have chosen to live. We subdue the world around us and its fun… right up to the point when we realize it’s been hell on our bodies, our world, and the people around us. 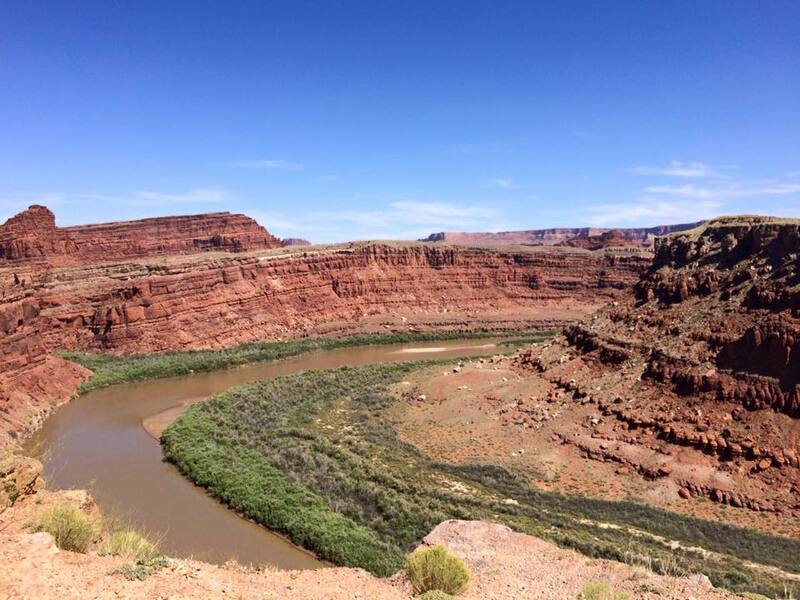 The Colorado winding through (making, ever so gently) the canyons that give this national park its name. Maybe that describes your physically lifestyle –all work and no play right up until it all breaks down. Maybe even your play has become work so your recreation is more wreck-reation than re-creation. Maybe its not taking care of your body, mind, and spirit as you bang around life as if your jeep is just a rental and you don’t have to maintain it. Maybe its about your relationships – as if people are just means to an end and then tossed aside. Maybe its about facing each conversation as a moment to prove yourself victorious in debate. Maybe its about being a rugged individual as if the world is not interwoven and inter-connected with all life. Maybe its about the creation around you – as if the world is our plaything to do with as we will. Maybe its about leaving wreckage behind us as if that is someone else’s to clean up. Maybe its treating the world as rental jeep. I told you. This felt like an enlightenment kind of observation. I think I could continue to find correlations here in every nook I look. We are off-roading. All of us. How we choose to travel says a lot about us, but also sets the tone for the journey ahead, because all of life has consequences. How we live among creation echoes ahead of us as we go – in our relationships, our lives, and our world.